Una herramienta en la nube que simplifica la supervisión de amenazas para profesionales de TI y MSSP. Threat Monitor™: detección de amenazas centralizada, respuestas automáticas y generación de informes sencilla. Obtenga los últimos consejos, trucos y asesoramiento de sus colegas SolarWinds geeks. Big Enterprise Vendors Build for Big Enterprise Price Tags. Is that really what you want? At SolarWinds, our mission is to make IT look easy. We do this by arming tech pros like you with powerful, affordable and easy to use software to solve today’s management challenges. Since day one, we’ve been all about IT management—and that’s all we’ve ever done. SolarWinds was founded over 20 years ago by IT pros who were searching for more efficient and affordable tools to do their jobs. Existing tools were bloated, difficult to install, and incredibly expensive, so we decided to build better tools ourselves. Today, we are the #1 network management provider in the world (according to IDC), and more than 300,000 organizations across the globe trust their monitoring to SolarWinds. We listen and learn from our loyal customers and use this deep understanding to create the kind of software you really need to be successful. What does it mean to see IT differently? While technology innovation has changed the world, the truth is the same big vendors have been running the same complex model of enterprise IT software for the better part of a century. And, new entrants aren’t doing much that’s different. We are different, and have been for 20 years. The truth of the matter is, as with species and evolution, different companies have characteristics—products, business model—that are a better or worse fit for existing environments. The IT landscape has changed, so why haven’t other vendors changed? It’s not just the cost of buying the puppy, it’s the cost of feeding the puppy that adds up. Learn how to maximize your time and investment. Is Your Network Monitoring Solution a Bad Fit? It may be time to right-size your network performance monitoring solution. Are you paying more for peace of mind than needed? Find out with our Total Cost of Ownership calculator. "The SolarWinds suite, including Orion, Network Performance Monitor, Patch Manager and SAM provide a cohesive, enterprise level monitoring platform that helps us to quickly diagnose issues at our divisions worldwide… Other products offer a wide variety of monitoring solutions, but none that I have used to date have the deep insight into the entire ecosystem that SolarWinds has." "We have 540+ stores around United States. Across the whole organization, we use SolarWinds Server & Application Monitor to monitor the network status of each location including every server that we use for IT operations. It has been a helpful tool for us to support every end-user as we have a full visibility of the network and server status in our company network." 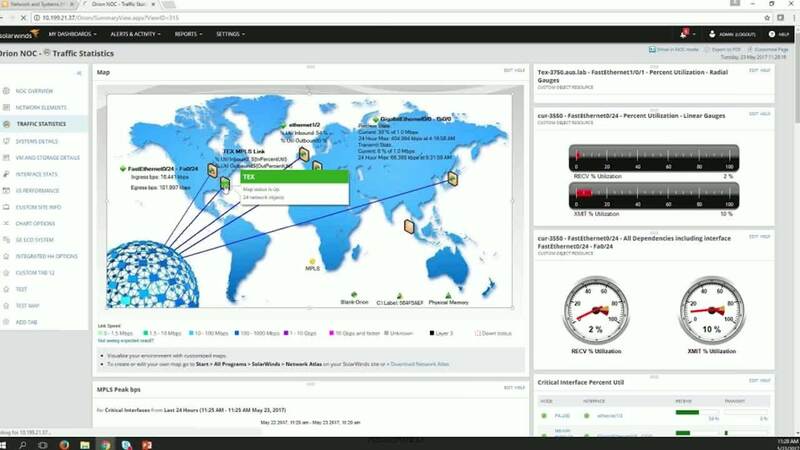 "SolarWinds is used as an operations alerting center for our networks. We have 70 branches across 12 states. With SolarWinds, we can see the health of our network and know when a problem arrives and can quickly work on resolving the issues."